Premium quality floor cleaner, cleans to a sparkel! Great for premium floors too! 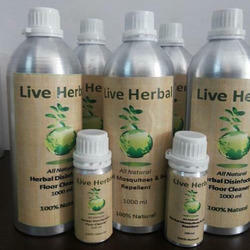 - It is a herbal Neem based product. - It is a multi purpose product and can be used for cleaning the floor, Kitchen Platform, Rooms etc. - One part of water is mixed with 100 - 200 parts of water and the emulsion is used to clean. - The above emulsion is used to make the environment free from diseases, flies. - Available in 200 ml, 500 ml, 1 ltr, 5 ltr, 20 ltr and 35 ltr. - Safe floor cleaner for most commercial and residential flooring. S Triagni Commercial Pvt. Ltd.
Herbokan Floor Cleaner - Removes many number of Pathogenic bacteria from effected surface, clean the floor. Owing to our in-depth knowledge in this domain, we are specialized in providing 5 Liter Floor Cleaner. Our offered Herbal Floor Cleaner is broadly used to clean the floor of homes, offices and hotels etc. Owing to the features like effectiveness and accurate composition, the offered floor cleaner is highly acclaimed by the clients. It kills the germs and other harmful bacteria from the floor.